Exterior light levels at the Holy Redeemer Lafayette Center, a retirement community in Northeast Philadelphia, were so low that they raised the risk of break-ins at the center. 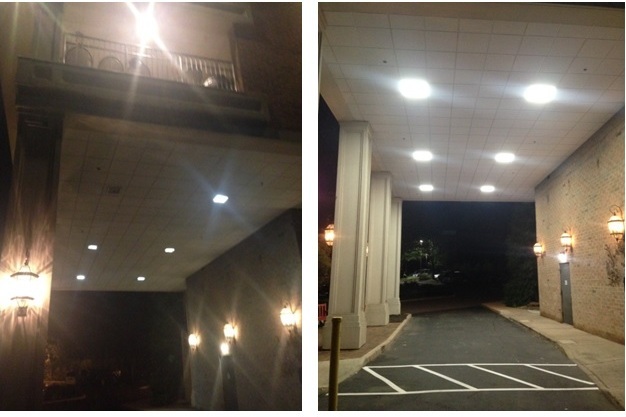 GreenTech was hired to replace obsolete metal halide, high pressure sodium and incandescent fixtures with new LED fixtures, and to lower the wall packs at the top of the building to a level where they would shed more light on the grounds in back of the building. In the entranceway, 175-watt metal halide lights were upgraded to 33-watt LED flat panels. In addition to enhancing safety and security, the retrofit also significantly cut energy consumption and utility costs.